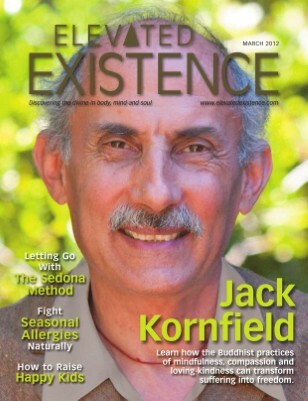 In the March 2012 Issue of Elevated Existence Magazine, we feature an exclusive interview with best-selling author and Buddhist teacher, Jack Kornfield. He reveals how freedom from suffering can be obtained by all -- no matter what our spiritual beliefs -- through the Buddhist practices of mindfulness, loving-kindness and compassion. Also in this issue is an in-depth feature on the Sedona Method. Open the door to emotional freedom, happiness and success by learning to release negative emotions, thoughts and memories with the Sedona Method. The March 2012 issue also includes a Healing Corner column on fighting seasonal allergies naturally, and a Healing Corner column on moving meditations. Additionally, the "Soul Connections" column on spiritual relationships looks at the reality of unconditional love, and we also highlight a book on conscious parenting.